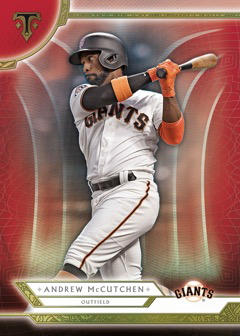 Jump to the 2018 Topps Triple Threads Baseball checklist and team set lists. 2018 Topps Triple Threads Baseball doesn’t change things up much. It sticks with the same general configuration, doesn’t stray far from recent designs and continues to stress a large checklist that’s populated by a large amount of low-numbered autographs and memorabilia cards. Once again, boxes have a pair of packs. On the basic side, both start a trio of base cards and two parallels. After that, it’s a couple of hits. One pack comes with an autographed triple relic (/99 or less) and a jumbo relic (/36 or less). The other has a triple relic (/36 or less) and either an autographed jumbo relic (/99 or less) or rookie autograph (/99 or less). Add it all up and it’s four hits per box. And like it’s been from the beginning more than a decade ago, this is one of those products that brings plenty of risk when you break down the cost but some big rewards when you get into the premium inclusions. As examples of this, at the case level (18 boxes), there’s an triple autograph relic with three different signatures and a one-of-one autograph relic. While 2018 Topps Triple Threads Baseball is largely about the hits, the product is framed around its base set. The main portion of the checklist has 100 cards. The two parallels per pack come from the following levels: Amethyst, Emerald (/259), Amber (/199), Gold (/99), Onyx (/50), Sapphire (/25), Printing Plates (1/1), and Ruby (1/1). Fleshing out the base set are Rookies and Future Phenoms Autograph Relics. These all have a signature as well as three swatches or pieces of gear. Base versions have 99 copies each and parallels go down from there: Silver (/75), Emerald (/50), Onyx (/35), White Whale Printing Plates (1/1), Ruby (1/1) and Wood (1/1). Triple Threads Autograph Relic cards have been a cornerstone of the brand from the beginning. These have three relic pieces paired with the autograph. Swatch windows are die-cut into letters or numbers to showcase things like nicknames, stats and other achievements. This gives them a distinct look over the many other autographed memorabilia cards, not only in this product but across the sport. Base versions for these have just 18 copies. Parallels come in Gold (/9), Sapphire (/3), White Whale Printing Plates (1/1), Ruby (1/1) and Wood (1/1). 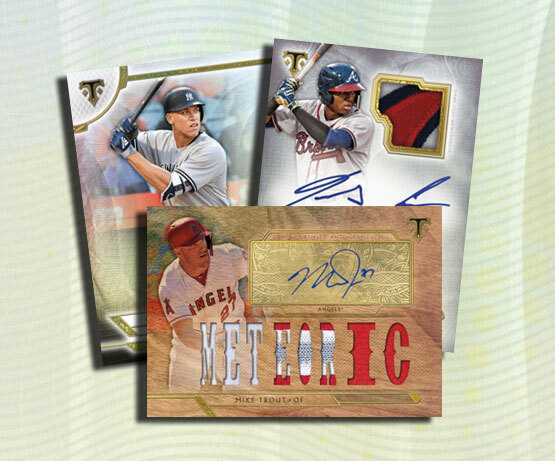 The case hit Triple Threads Autograph Relic Combo cards (/36) feature signatures and swatches from three different players. Rarer versions are Silver (/27), Emerald (/18), Gold (/9), Sapphire (/3), White Whale Printing Plates (1/1), Ruby (1/1) and Wood (1/1). 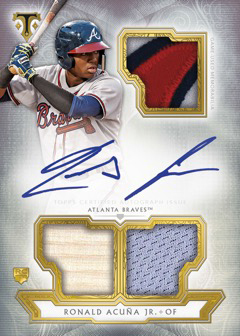 Autograph book cards in 2018 Topps Triple Threads Baseball have either massive patches, lots of pieces or some other super-premium (and rare) additions. Jumbo Plus Autograph Relic Books have a jumbo patch alongside two additional patches and an autograph. Letter Plus versions are similar except they have a letter from the back of a jersey instead of the jumbo patch. Both of these are numbered to 3 and have Ruby (1/1) parallels. Autograph Deca Relic Book cards have ten swatches. Combo versions have ten different players for both the signatures and the memorabilia pieces. Both have base versions numbered to 10 alongside Gold (/5) and Ruby (1/1) parallels. Triple Threads Windows Into Greatness Autographed Relic books are new for 2018. These three-panel cards have just five copies each as well as Gold (/5) and Ruby (1/1) parallels. Triple Threads Autograph Single Jumbo Relics have a bigger-than-average memorabilia piece alongside the signature. Base versions have 99 copies while parallels are done in Silver (/75), Emerald (/50), Gold (/25), Sapphire (/10), and Ruby (1/1). 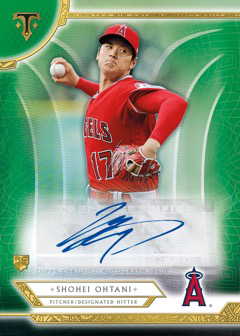 Although most of the autographs in 2018 Topps Triple Threads Baseball come with relics, not all of them do. There’s more basic Rookie Autographs, all of which are numbered. Parallels include Emerald (/50), Gold (/25), Sapphire (/10), White Whale Printing Plates (1/1) and Ruby (1/1). Cuts come in a couple of different forms in 2018 Topps Triple Threads Baseball. Cut Above Cut Signature Relics highlight one player. Dual Cut Above Autograph Books have memorabilia and cuts from a pair of players. No matter the type, these are all one-of-ones. Like the autographs, 2018 Topps Triple Threads Baseball relics come in several forms. Three-swatch Triple Threads Relics have a few varieties themselves. In additional to the traditional basic ones, there are Legends, Combo with three different players and new Players Weekend cards. Similar to the autographed versions, the windows on these are die-cut in a variety of ways. Base versions for every type have 36 copies. Parallels land in Silver (/27), Emerald (/18), Gold (/9), Sapphire (/3) and Ruby (1/1). Jersey worn during 2017 All-Star Game festivities are used for several scarce memorabilia inserts. 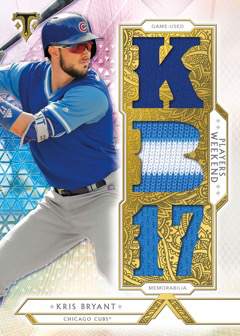 Triple Threads All-Star Patches are numbered to 9 and have Ruby (1/1) parallels. 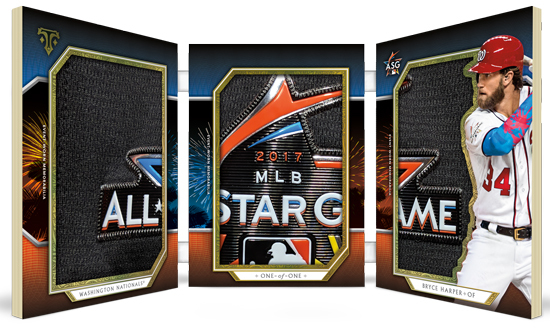 All-Star Laundry Tag, All-Star Jumbo ASG Patch, and All-Star Jumbo Sleeve Patch are all one-of-one book cards. Similarly, All-Star Majestic Logo Patch cards are each one-of-a-kind. 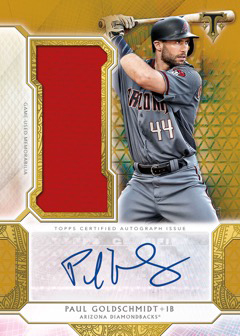 Jumbo Plus Relic (/3) and Letter Plus Relics (/3) add more book cards to 2018 Topps Triple Threads Baseball. Jumbo Letter/Number/Logo books (1/1) combine three distinct memorabilia elements. 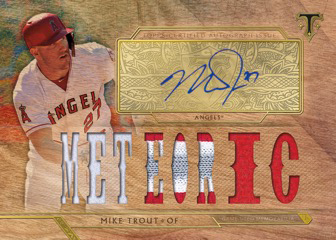 Triple Threads Deca Relic Combo book cards (/10) feature pieces from ten players. The new Windows Into Greatness (/10) books have unsigned versions as well. Rounding things out on the extremely rare side are one-of-one Bat Knobs book cards. Triple Threads Jumbo Relics (/36) come with over-sized swatches compared to many other parts of the 2018 Topps Triple Threads Baseball checklist. Parallels are Silver (/27), Emerald (/18), Gold (/9), Sapphire (/3) and Ruby (1/1). 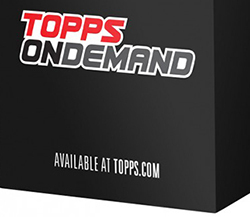 Want to know what cards your favorite team has in 2018 Topps Triple Threads Baseball? Here’s the checklist broken down by team. Scroll through or click below to go directly to that team. When are they going to do away with printing plates? How many people get excited to pull a 1 color plate, it lost its allure about 10 years ago. If they keep doing printing plates at least have them as a bonus and don’t count them as a hit, cause that’s a crummy hit. Wow! Talk about overpriced trash! I just watched someone open 13 boxes; best card was a triple jersey Altuve (sticker) autograph numbered to 25. The case hit was a triple relic auto book Nolan Arenado numbered to 9 (ooooooh!!!!). He got 4 worthless nobody redemptions and a ton of garbage jersey cards, some of which are unreadable because the “designers” at Topps know zip about typography.